Built by a sea captain, full of light. What’s your homestead’s story? 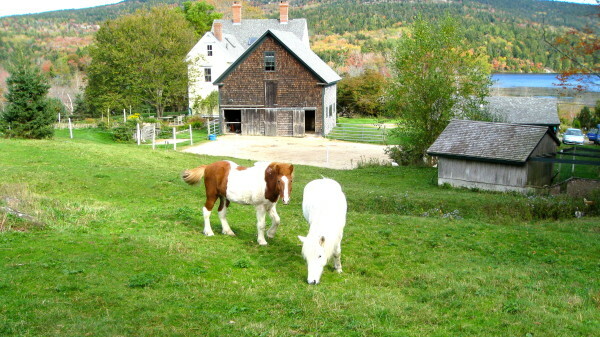 The Farm at Seal Cove Pond. Why did you choose to buy your home? We were fleeing the rat race in the New York City area and looking for a house on the backside of Mount Desert Island from which we could run our mom and pop law practice. We began the search in 2001 and originally thought we’d locate in Southwest Harbor, but when we saw this lovely place overlooking Seal Cove Pond and Acadia National Park, we couldn’t resist it. We ended up having chickens and two Icelandic horses as well as a cat and a dog and a huge vegetable garden — and have never looked back. The house has great charm and character and is something of an island landmark, known to many. What are some physical features that make your home distinct? It is full of light because all the windows are very long, running almost to the floor, and the ceilings are very high. Also, the living room has a beautiful arch in the ceiling, which seems to have been a purely decorative touch; no one can figure out why it’s there otherwise. There are “eyebrows” over the windows on the exterior and other ornate details. What’s the history of your home? The house was built in 1887-88 by James Studley Powers, a sea captain from Swan’s Island. He is buried in a little cemetery down the road. He seems to have been a man of some means as the house he built is so large, and his gravestone is the biggest in the cemetery. At one point the house served as the post office, and the post office building connected the timber-framed barn, built in 1887, to the house. The house was bought from Powers’ daughter by Benjamin and Helen Carter and later owned by Leon and Esther Butler. Baptist church services were reportedly held here in the 1960s. In 1975, John (J.B.) Brown and his former wife Barbara Brooks bought it and began the very successful Seal Cove Farm goat cheese business, which Barbara still runs from Lamoine. They also operated a bed and breakfast here for many years. We purchased the house from J.B. and his wife Emily in 2003. 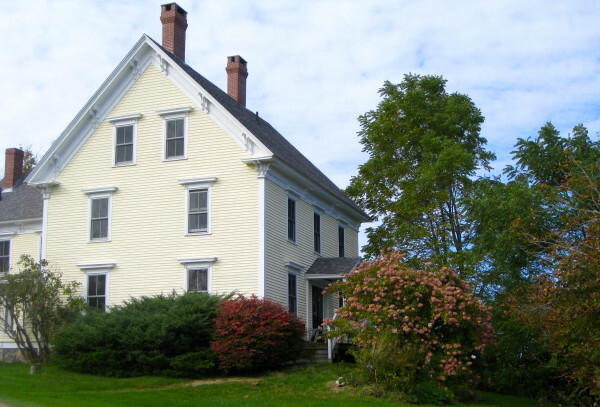 We have made many renovations, including replacing all the windows with matching thermal paned windows, creating an office suite with a skylight and French doors on the third floor, and installing in a Harmon woodstove, but we have been careful to try to preserve the immense charm and character of this iconic Maine farmhouse. What’s does the future look like for your home? Regretfully, we feel it is time to downsize and so have put the house on the market. But we would hate to see it changed very much; with its history and beauty, one feels something of a moral obligation to maintain it as a reminder of a bygone era. These kinds of houses simply aren’t made any more. 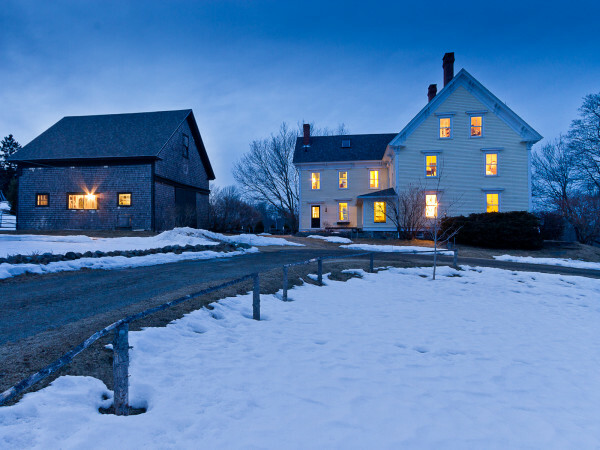 Whether you bought a farmhouse built in the 1800s, or designed and constructed your own, we’d like to hear about it. What’s your home’s story? What makes it different? Has your homestead been passed down through the generations? Do you know the history of the land on which it was built? Does it have unique characteristics, such as a fireplace made by hand out of field stones, a secret passageway, or rafters reused from an old barn? Send us stories about your house and land, and we’ll do our best to feature them. Email editor Erin Rhoda at erhoda@bangordailynews.com with your name, town and story.